Organizing a wedding, shower, or other large-scale celebration can be complex, time-consuming and expensive! Many choose to go the Do-It-Yourself route, but “DIY wedding” or celebration isn’t always synonymous with “simple”. I can guide you through the planning and creation of handmade elements for your event! 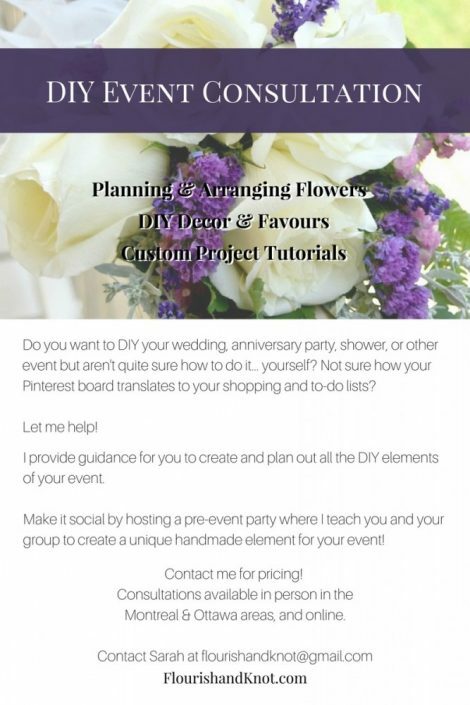 Simple floral arrangements, handmade decor, and DIY favours are just some of the areas I can help with. Choose from many options, including in-person or online consultation (I can help you make your to-do and to-buy lists! ), custom tutorial creation, and in-person or online workshops. Going DIY doesn’t have to mean headaches and frustration! Please email me for more information! You can read about the handmade elements I incorporated into my own wedding here!